Are you wondering if you should have black mold testing conducted in your home? You’re probably aware of the many health risks associated with black mold and like many homeowners, you probably want to make sure there is no black mold in your home. We’ll tell you when a black mold test may be warranted, as well as when it’s probably not necessary. There are several instances in which it can be helpful to test your home for black mold. If you’ve found mold in one area of the home and want to make sure it hasn’t spread, you may want to test other areas of the home for mold. Most strains of mold spread very easily. Mold produces spores similar to seeds and these spores are smaller than grains of pollen and are very light. The slightest air current can carry them from one area of the home to another. When the spores land on various household surfaces, and the conditions are right, mold can begin to grow there. If your house has recently been flooded, we recommend testing for black mold. Flooding frequently leads to the growth of large amounts of hazardous mold and you should have your home tested to make sure it’s safe to move in again. If you have flood insurance, your insurance policy may pay for mold testing and any subsequent mold removal. Check with your insurance agent if you have questions about your policy. It may be wise to test your home for mold after any significant water damage, as well, such as storm damage to the roof or a broken pipe. If the repairs are covered by your homeowner’s insurance, mold testing and mold removal may also be covered. If you have health problems that might be related to black mold exposure, especially if your doctor is having trouble determining the cause of your symptoms or if you’re not responding well to treatment, you might want to have your home tested for mold to see if that might be causing your symptoms. Exposure to black mold can cause many health problems, including trouble breathing, coughing, sneezing, sore throats, headaches and migraines, eye and ear infections, and fatigue. You can read more about black mold-related health issues. You can also consult your doctor, an allergist, an infectious disease specialist or an environmental health physician for more information on mold-related health problems. Ask your physician if having a black mold test conducted in your home might help with diagnosing your illness. The U.S. Environmental Protection Agency (EPA) recommends testing for mold after having black mold removed from your home in order to make certain the job was done thoroughly and all traces of mold have been removed. If small amounts of mold are left behind, it probably will grow and spread and you’ll soon have a large scale mold problem to deal with again. This follow up testing should be done by an independent contractor, not by someone affiliated with the professional or company that handled the mold removal. 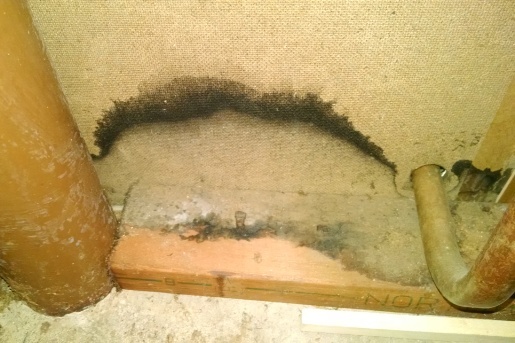 It's not always necessary to test your home for black mold. The U.S. Centers for Disease Control and Prevention (CDC) says that in most cases, testing to see what kind of mold is in your home is not necessary. That is because all types of mold carry health risks and all types of mold can damage your home, so any mold in your home needs to be removed, no matter what type of mold it is. If you know you have mold in your home but you don't need to find out what kind of mold it is, then you can save your money and avoid testing it. In addition, if your home has not been flooded recently and if you have no reason to suspect mold in your home, there is no reason to test for mold. It is not something homeowners need to do routinely if there are no signs of the presence of mold growth. The U.S. Environmental Protection Agency recommends hiring professional mold testers that comply with the analytical methods established by such professional organizations as the American Conference of Governmental Industrial Hygienists and the American Industrial Hygiene Association. Most professional mold testers are engineers and all should be experienced in mold sampling methods and the interpretation of test results. While there are do-it-yourself mold tests available, these are often not accurate and since black mold carries so many serious health risks, it's important to have the test done correctly and get accurate results. Follow this link to find qualified professional mold testers in your area.